3/8" safety collared, hex head screw eliminates danger of screwdriver slipping and damaging the hose. 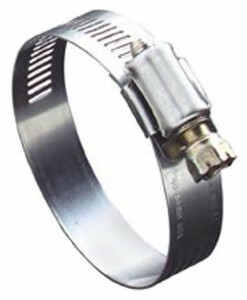 The combination collared and hex head screw can be used with blade type and nut drivers as well as socket wrenches. 9/16" band width offers greater sealing area. 300 series stainless steel band and housing. 3/8" zinc plated carbon steel, collared, hex head screw.